AA Dhand sits at a table in the balcony cafe at Bradford’s magnificent old Wool Exchange and points to the spot where his latest victim was found. Her name was Usma and she met her tragic fate at the start of City of Sinners, the Bradford crime author’s latest novel. “That idea came to me when I was doing the Girl Zero book launch,” Amit Dhand says, referring to his 2017 thriller. It was launched in the same building, which now houses surely the most beautiful branch of Waterstones in the country. Dhand continues: “I was being interviewed [at the launch] and mid-question I looked up to the ceiling and thought, it would be really bizarre if there was a dead body hanging from that ceiling. Ideas just ping into your mind. Dhand’s fictional detective Hardeep Virdee – known as Harry – had to answer those questions. The title City of Sinners – the third Harry Virdee book – offers a fair idea of how the Yorkshire city is portrayed. The ornate Wool Exchange, built in 1867, is a symbol of the prosperity Bradford enjoyed as the global centre of the wool trade in the 19th and early 20th Centuries. The city’s subsequent decline provides the grit that is plentiful in Dhand’s books. In his 2016 debut Streets of Darkness, Bradford is described as “the cesspit of Yorkshire”. But at the time he was writing, he says was angry at how the city had been treated, not least after a substantial part of the centre was flattened for a promised regeneration project that then stalled for years after the recession. “When I put that line in about the cesspit of Yorkshire, it was because I felt angry that the city had just been forgotten,” he says. “It had been left. You know, we’ve knocked it flat, we’ve cut all of the services – youth services, council services – and we’ve just left it. “And nobody cared, and nobody did anything about it. So I wrote the book really bitter. Whoever allowed that to happen allowed Bradford to descend from a position of greatness, which is what it was, into what it became, which was abandoned. The reputation may not be helped by crime thrillers that paint a picture of its mean streets. But Dhand says his books, which tackle racial and religious tensions, child grooming and terrorism, can’t try to please anyone but his readers. The author moved to Bradford at the age of two, when his dad bought a corner shop there. When they arrived, they discovered they were the first Asians on the estate. On the first day of business, Dhand says, more than half the customers cancelled their newspaper deliveries and an elderly local dropped dead of a heart attack in the shop. However, Dhand says his father took on the challenge of changing their neighbours’ attitudes. Hours upon hours were spent observing human behaviour from behind the corner shop counter. Dhand later trained as a pharmacist and still works in pharmacies in Bradford and Leeds . He now likes to use his dad’s phrase “change the narrative” himself about how he wants to break the mould for British Asian authors and characters. He is the first Asian author to write a series of crime novels, he says. 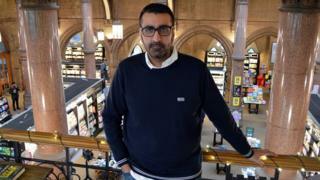 The books are now being developed for the BBC, and he is desperate to see a TV drama that shows a wider range of Asian characters. He says: “I’d heard a lot, ‘Asian people don’t write crime.’ I was fed up with that because I’m not a Goodness Gracious Me caricature and I’m not a Citizen Khan sketch. “There’s a place for those and a place for comedy, but we have to balance it with real, gritty heroes who we can look to. He recalls one occasion when a group of young British Asians challenged Dhand to name a true global superstar and role model from an Asian background. If and when Harry Virdee reaches the screen, Dhand hopes he will give those boys a person to look up to. City of Sinners is out in paperback on 21 March. The follow-up, One Way Out, is published on 27 June.